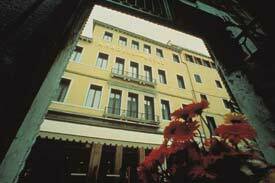 These hotels are within walking distance of the Venezia Santa Lucia train station. ABOVE: The Hotel Ai Due Fanali (see our illustrated review) is about five minutes from Venice's Santa Lucia Railroad Station, on the only campo in Venice that faces the Grand Canal. In nice weather, you can have breakfast on a rooftop terrace. 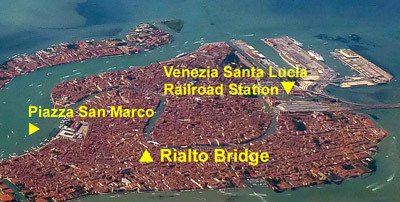 BELOW: This aerial photo shows the railroad station's location at the edge of Venice's historic center. In many cities, hotel districts near railroad stations can be depressing, and sometimes they're even dangerous. Not so in Venice: The streets near Santa Lucia Railway Station may be busy and geared to tourists, but the atmosphere is pleasant enough, and the convenience is hard to beat if you're spending only two or three days in Venice. Many of the hotels in this article are on or near the Rio Terà Lista di Spagna (usually shortened to "Lista di Spagna"), the first segment of the main pedestrian thoroughfare between the station and the Piazza San Marco. The Lista di Spagna is a lively place of hotels, restaurants, and souvenir shops, but you'll also find plenty of businesses that serve local residents. And when you get tired of looking at souvenir t-shirts or carnival masks, you can cross the Cannaregio Canal to explore the Venetian Ghetto and the many local shops, restaurants, and cafés along the connecting streets that feed into the Strada Nova. Best of all, you can reach the hotels in the first section of these listings area without crossing bridges--a great convenience if you're using a rolling suitcase. We've also included listings of hotels across the Grand Canal. These hotels require crossing a bridge (or, in some cases, several bridges). Choose them if you're looking for a less "touristy" neighborhood or if you want to be close to the Piazzale Roma for an early airport or cruise departure. Links in this article will take you to our Venice Hotel Directions pages and our partner, Booking.com (which offers "guaranteed lowest available rates" at nearly all hotels and guest houses in Venice). The area near the railroad station is about a half-hour walk from the Piazza San Marco. To reach the piazza, head away from the station along the Lista di Spagna, cross the Cannaregio Canal, and follow the yellow "San Marco" signs or the daytrippers who'll be headed in the same direction. Or use the expensive vaporetto public water buses. Through express trains from other Italian cities typically use the Venezia Mestre railroad station in Mestre, a suburb on the Venetian mainland. Our Mestre Hotels page describes good, moderately-priced hotels that face the station or are within walking distance. ABOVE: The Hotel Amadeus is just a short walk from Santa Lucia Station. All of the hotels in this section are within very easy reach of the station, usually without crossing any bridges. (In some cases, the walk is only a minute or two.) We suggest leaving the station via the convenient side exit near Platform 1, which will lead you down to the water via a gently-sloping sidewalk. If you're traveling light, the sestiere or district of Santa Croce is worth considering. The neighborhood attracts fewer tourists than the area around the station, and it's especially convenient to major art museums and other attractions in Santa Croce, San Polo, and Dorsoduro. Below are listings for hotels that are within a reasonable walk of the Ponte dei Scalzi (the bridge that crosses the Grand Canal near the railroad station). We've divided them into two groups, with the second being especially handy to the Piazzale Roma. The hotels listed below are especially handy if you're connecting to or from the airport, because Venice airport buses depart from the Piazzale Roma nearby. Taxis, shuttle buses, and the People Mover to the Marittima Cruise Terminals also leave from the Piazzale Roma. 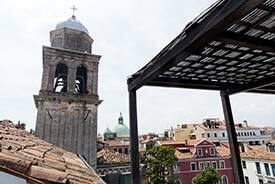 This highly-regarded hotel overlooks the Grand Canal from the edge of a little square next to a church. It's also directly across the Grand Canal from the railroad station. The hotel's location is surprisingly quiet, given its convenience, and you can sit at a café table next to the water when you're recovering from a day of sightseeing. Tip: If you're looking for a hotel near the Piazzale Roma that's extremely convenient to the airport or the Marittima cruise terminals, see 10 hotels closest to airport buses and 17 hotels closest to cruise ships.